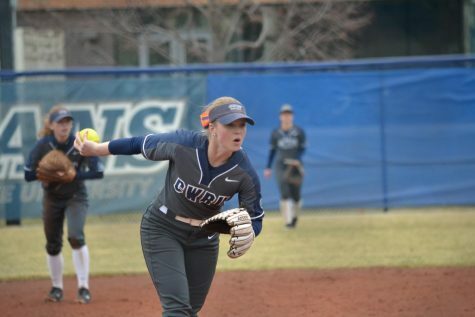 Pitcher Annie Wennerberg focuses on throwing quality strikes against New York University. 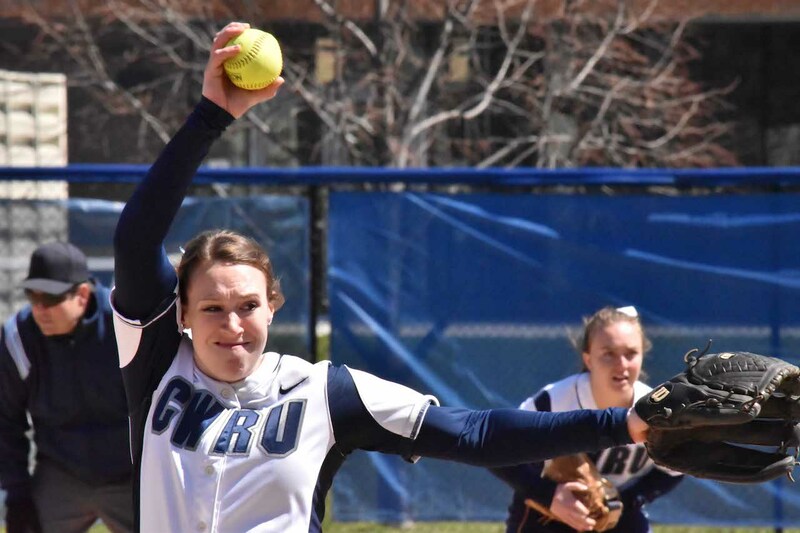 Those were the words of Case Western Reserve University softball Head Coach Josie Henry after her team completed yet another late game comeback victory. Of the team’s nine home victories this year, four have come after the Spartans scored in the bottom of the final frame. 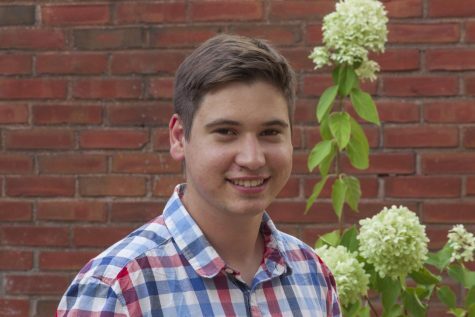 The latest CWRU comeback came in the the team’s last game of their four game home series against New York University (NYU), with the Spartans prevailing 6-5. The other three games were just as close, with the hosting Spartans winning two of them by a combined two runs and losing the other by four. 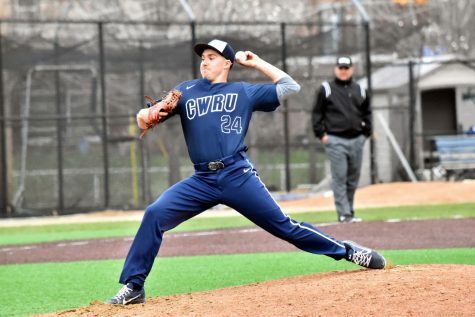 With the series win over a University Athletic Association (UAA) rival, CWRU improved their record to 14-9 with a 5-4 mark in conference play. The first game of the series was the lone Spartans’ loss. NYU pounced early, scoring four runs in the game’s first two innings off of fourth-year pitcher Annie Wennerberg. She did well over the final five innings, holding the Violets to just one run on five hits. 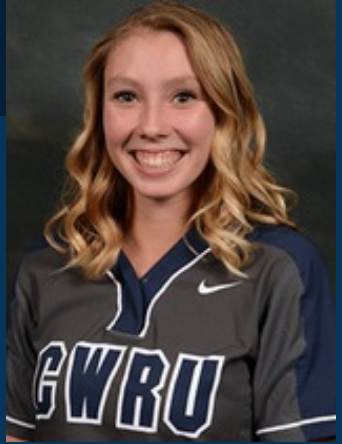 First-year third baseman Melissa Cuellar knocked in the lone CWRU run with a sacrifice fly in the second inning. Second-year pitcher Karissa Zubulake limited the Spartans to just four hits and the solitary run in seven strong innings. However, the Spartans figured Zubulake out in her next start the following day, when the team scored six runs on 11 hits. Henry specifically cited the team’s improvement on hitting the ball on the outside part of the plate as well as their patience in Zubulake’s second start. Cuellar was the hero in that game, the final one of the series, driving the winning run with a two-out double in the bottom of the seventh. 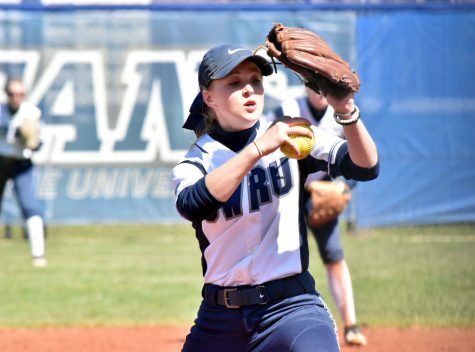 The hit capped a four-run CWRU rally in the final frame with contributions from everyone. 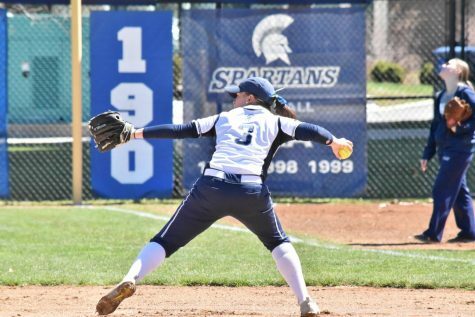 With her team down three, Wennerberg knocked in both second-year shortstop Nicole Doyle and third-year second baseman Maren Waldner with a single to cut the Spartans’ deficit to one. Wennerberg scored on a single by first-year designated player Nicole Carty to tie the game. The fleet-footed Carty scored all the way from first on Cuellar’s double, as Spartans fans went hope happy after with the walk-off victory. Earlier in the day, the fans were also cheering as CWRU defeated the Violets 4-3. Third-year first baseman Grace Tritchler led the Spartans’ offensive attack, going 1 for 2 at the dish with two RBIs. Wennerberg and Doyle drove in the team’s other two runs with hits in the third inning. Following the weekend series, Tritchler was selected as the UAA Hitter of Week. Over six games, she batted .500 with three home runs and 11 RBIs. Tritchler leads the team in the latter two categories. That victory was the Spartans second consecutive 4-3 win, with the team taking the second game of first doubleheader by that score. The top of the lineup came through again for the Spartans as Doyle, Waldner, Tritchler and Wennerberg were the only players with hits on the team. 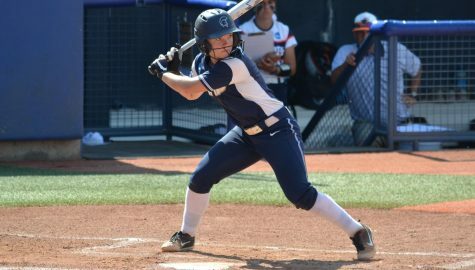 Tritchler hit a solo home run, Waldner knocked in two on a groundout and a single and Doyle also contributed a run-scoring single. The four runs would prove to be just enough to take the game as NYU mounted a late-inning comeback to bring the game within one. Unlike the Spartans, the Violets could not finish the job. The team travels to Missouri to wrap up UAA play with a four game series against Washington University in St. Louis from April 14-15. Henry could hardly contain her excitement when speaking about the matchup with the Bears.